Institute of Banking Personnel Selection(IBPS) has successfully conducted the IBPS Specialist Officer (SO) Examination 2018 on 29-30 December 2018. The IBPS Specialist Officer (SO) Examination 2018 was conducted to fill up the Specialist Officer posts. There were a total of 1599 posts for this recruitment. A huge rush has been noticed to participate in this examination on the exam day. We know that they all are waiting to know about their performance in the following examination. So, we have good news for all the candidates who are set in the IBPS Specialist Officer (SO) Examination 2018. The authority Institute of Banking Personnel Selection(IBPS) has released the IBPS Specialist Officer(SO) VIII Mains Result 2019. Candidates can now be able to check whether they’ve passed the written or not. Candidates need to visit the IBPS Official Website to check their IBPS Specialist Officer(SO) VIII Mains Result 2019. The candidate who has appeared in the IBPS Specialist Officer (SO) Examination 2018 are now able to check their result from the official website. The result is available in the PDF form. 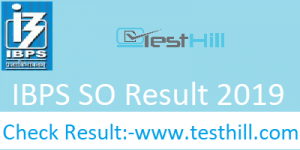 Candidates can check their roll no in the IBPS Specialist Officer(SO) VIII Mains Result 2019 PDF. All candidates are suggested that they can check their IBPS Specialist Officer(SO) VIII Mains Result 2019 from this page also, as we have updated it on this article as well. They don’t need to provide any personal credential to download the result pdf. All they need is to click the direct download link given below in the table. Participants who passed the written examination will be called for the further recruitment process. All the participants who have set in the written examination can now be able to know their result. They can check this out by following the given steps.